Fall, that time of year when a young man’s fancy turns to…a budget crisis, political dysfunction, a renewed health care mess and, oh, yeah, off-year elections. So, let’s see, the state still lacks a revenue plan to pay for a spending plan it passed some months ago, so now some bills aren’t being paid. The state House Republicans have come up with a wacky plan to borrow $1 billion (at a crazy, long-term price, by the way) to close the budget gap, while the state Senate (which voted it down 47-3) and Gov. Tom Wolf seem none too impressed. To put it basic terms, the House GOP voted to spend “X” amount of money in the budget. But they want to fund it with “Y” amount of money — borrow some of the rest and loot things like transportation funds to try and close the gap. It it weren’t deadly serious, it would be hilarious. I do want to remind you all, this is what you voted for in the last few years, even as the state legislature became increasingly more unable to do its job. In fact, one might argue that the worse job these folks do, the better they seem to fare on election day. Putting it basic terms, if House Republicans wanted to avoid a tax hike — the state Senate and Gov. Wolf broadly agreed to a plan that would hike taxes about $500 million — they should have passed a budget that spent less. But….they didn’t. So here we are — broke, taking the hit from credit agencies (that means borrowing money down the road will become even more expensive) as the commonwealth becomes a laughingstock. Oh, and for fun, the House GOP leadership attacked Standard & Poors for downgrading the state’s credit rating, instead of taking responsibility for years of fiscal mismanagement, as cited by the rating agency. Which, of course, makes it all the more laughable that U.S. Senators Lindsay Graham (R-SC) and Bill Cassidy (R-La.) are trying one last gasp to “repeal” the Affordable Care Act — by block granting the money (actually a lot less money, $215 billion less from 2020 to 2026, according to estimates from Avalere Health) to the states to cover Medicaid and health care subsidies. And yes, on average, Pennsylvania would lose more than most states, as it expanded Medicaid under the ACA to provide coverage to low-income folks. Although the fate of the bill is in doubt after Sen. John McCain came out against it — citing a desire for regular order and resumption of work on the bipartisan effort that Graham/Cassidy stopped in its tracks — the GOP appears ready to press forward with the bill, even though it seems unlikely to get 50 votes in the Senate. To be blunt, this is a heartless, nasty bill that will hurt poor folks, folks over 50 and those with pre-existing conditions — in some ways it is worse than the bill the GOP tried to rush through earlier in the year. But don’t take it from me. How about from a neighboring governor — a Republican — who doesn’t think this is such a great idea. At least five other Republican governors: Charlie Baker of Massachusetts, John Kasich of Ohio, Brian Sandoval of Nevada, Chris Christie of New Jersey and Phil Scott of Vermont also came out against the bill this week, as did independent Alaska Gov. Bill Walker. It goes without saying that Pennsylvania Gov. Tom Wolf (D) opposes the bill, too. Of course, Republican leaders in the U.S. House and Senate have ruled out bipartisan efforts — one led by U.S. Sen. Lamar Alexander (who actually chairs the Senate Health, Education, Labor and Pensions (HELP) that should have had jurisdiction over the Graham/Cassidy bill, but shockingly, doesn’t) and an effort by more than 40 U.S. House members of both parties — including two local Congressmen — to sure up the current system and reform some of its clear shortcomings. The GOP leadership will literally do almost anything to get this bill passed, regardless of the long-term consequences. The bill is being tweaked to give Alaska some extra benefits — including the existing tax subsidies — to woo Sen. Lisa Murkowski. Pennsylvania? Totally getting screwed because Sen. Pat Toomey is a true believer who seems to believe poor people should just be polite and die quietly in the corner instead of getting the health care they need, so no sweetener for the Keystone State. Nope, once again, Republican leadership (allegedly spooked by a threat of a cash cut off by those lovable Koch Brothers and other big-money GOP donors seeming furious that the serfs have not been put in their place) are once again in “my way, or the highway” mode, which previously has left them overturned and in a ditch on the side of the road. Using the alleged threat of Sen. Bernie Sanders’ Medicare For All, single-payer proposal as some sort of boogie man (ironically, according to a new Politico/Morning Consult poll, single-payer is kind of popular, with 49% supporting it and only 35% opposing it) doesn’t seem logical, either. Then to top it off, Graham attacked TV comedian/Host Jimmy Kimmel for criticizing the bill on late night TV, Tuesday, suggesting that Cassidy broke the promise he made on the show that any bill he backed would require coverage for those with preexisting conditions. Graham claimed the bill does, but under the block grant system, states are basically allowed to set whatever rules they choose, the individual mandate is eliminated (taking more healthy people out of the insurance pool — and at minimum spiking prices for older, sicker folks and potentially denying coverage at all). Estimates (as again, there are no Congressional Budget Office numbers because of the rushed process of the bill) say some 1.066 million Pennsylvanians could lose their coverage. An analysis by Politico.com of the war of words between the two senators and the late night comic — wait for it — suggests that Kimmel seems to have a better grasp of the legislation, if only because of the funding cuts to Medicaid funding pretty much has to mean less people covered, as Kimmel pointed out in his response to Graham. As above with the state budget, instead of working to fix a lousy plan, the GOP playbook is to attack those who point out how crappy their plan is (which, granted, we’re used to on the local front). Seriously, this is their best play? Aside from it being amazingly cruel to knock millions off their health care (as one of those people who buys their family health insurance on the exchanges — my wife and I are self employed — I am deeply unamused) and potentially send untold numbers of senior citizens out of managed care and into their kids’ homes, or worse, the streets — the idea of giving the state legislature control over millions of dollars more of federal money is laughable. The state legislature (see above) hasn’t proven it can manage a Starbucks gift card, let alone hundreds of millions of dollars for health care. OK, so the finances are silly, but maybe, just maybe the politics are good, right? If, somehow, this smoking wreckage of a bill passes (Axios is reporting that most GOP senators don’t even know what’s in the bill) — one that won’t get a CBO score or markup, or any meaningful hearings before rushing out to strip at least 10 million of their health care and likely raise premiums starkly for the rest of us — there will literally be political hell to pay. You see, despite years of trashing “Obamacare,” the darn thing has become pretty darn popular, what with the better health care, the end of folks getting tossed off their insurance when they get sick and all. Voting to kill it off to keep 20 percent of the population happy — those folks who would rail against oxygen if Barrack Obama endorsed it — might not be the smartest political play. It has to give U.S. Rep. Ryan Costello (R-6) the chills. Costello voted against the last GOP health care bill that narrowly passed the house and has been fleeing the right wing of the party like Frankenstein running from torch and pitchfork carrying villagers. And yet, because the average person gets their political news from Twitter/Facebook/random Social Media, the voters will have no idea and sweep out moderates (see, 2010 and 2006) because someone needs to be blamed for this mess. I’ll note Democrat Chrissy Houlahan — Costello’s most likely Democratic opponent and the target of National Republican Campaign Committee demands that she take a position on single-payer health care — has called on him this week to disavow this legislation. That race and the race of U.S. Rep. Pat Meehan (R-7) are only going to get more and more difficult, if Republicans keep using this playbook. Which, by the way, turns us to the off year elections, this year. 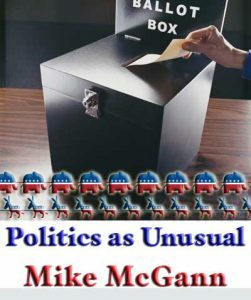 You see, Democrats are notorious for not voting in these elections, often because they think such meager races are beneath them – voting for county row offices, boards of education and municipal offices just doesn’t capture their imagination the way a spirited argument over the merits of single-payer health care or controlling carbon emissions does. Unless of course, Congress does something really stupid and waves a red flag in front of them. Already at a fevered pitch because of President Donald “Rocket Man” Trump, this might just be enough to get them away from watching Rachel Maddow and actually, you know, vote. As nobody knows (except for government geeks like me) who the county’s Clerk of Courts is (or even what they do) the voting will be strictly partisan — if a large percentage of the population thinks the Republicans are screwing up, they’ll come out and vote for the Democrats, just to send a message (conversely, frustrated Republicans will stay home on election day). The results of a study, produced earlier this year, determined Pennsylvania has the fourth most corrupt legislature in the country…in the COUNTRY. It’s also one of the most expensive and one of the few where the representatives are full time employees. If the incumbents are voted out they’ll be replaced with corrupt politicians from the “other” side. Since Pa doesn’t have a referendum process, what’s process to move these bums to part time and impose term limits?